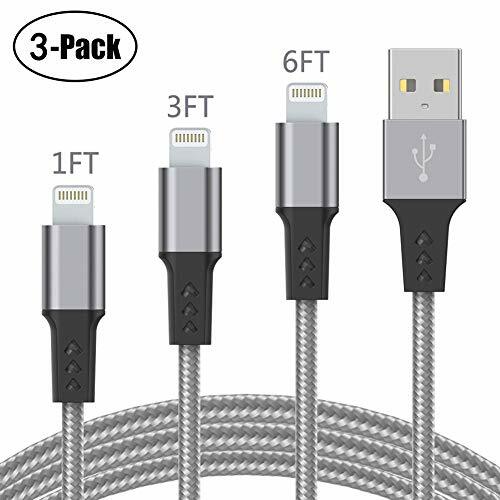 High Speed Apple Cell Phone Charger Cable 3 Pack 50% OFF with Code! Fast Charging: This chargers cable cord ensure a maximum charging speed up to 2A, charger faster than most standard cables and work better for speed. Durable nylon braided: Different from traditional USB cable, sturdy and tangle-free design, covered with durable and premium Nylon Braided jacket which looks and feels great. Different Size: 1FT 3FT 6FT Charging cable meet your different needs. Compatibility: Compatible with PhoneCords XS / XS MAX XR X 8/8plus/SE/7/7Plus/6Plus / 6s Plus/ 6s /6/ 5s / 5c / 5，etc. Warranty Policy: For 12 months after the date of purchase, we take care of all quality-related issues with a Replacements or Refund. Please contact our Covery support team at the first time if you got the defective item.